Phoneticians describe vowels using reference qualities or cardinal vowels. These help us to locate vowels in an auditory-acoustic vowel space, much as the cardinal points on a compass help us to navigate in geographical space. The articulation of vowels is much harder to measure than their acoustics. 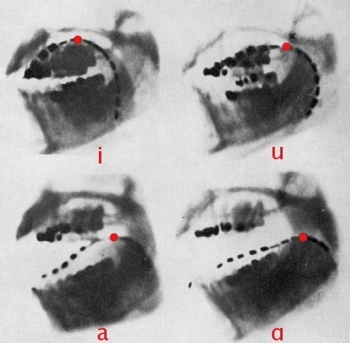 Here are x-rays from 1917 of Daniel Jones articulating the four “corner” cardinals, [i], [a], [ɑ] and [u], with red dots showing the approximate location of the highest part of Jones’s tongue, on which a chain of small lead plates has been placed. Below I’ve superimposed the four x-rays to show the relative positions of the four vowels. 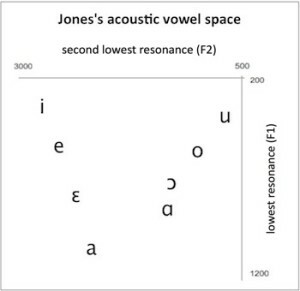 We can see a very rough similarity to the acoustic vowel space. The tongue is visibly close to the hard palate for [i], and the jaw is visibly more open for [a] and [ɑ] than for [i] and [u]. Also the tongue is pulled back towards the throat for [ɑ]. Frontness/backness and closeness/openness have become established as the conventional labels for the two dimensions of the vowel space, although the acoustic-auditory space also takes into account the effect of a further articulatory factor which is not visible on the x-rays, namely lip-rounding. The lips are spread for cardinal 1, [i], tightly rounded for cardinal 8, [u], and intermediately positioned for the other vowels. 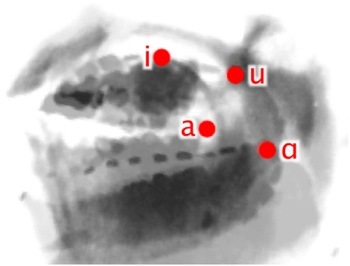 When learning to produce cardinal vowels, we can use the palatal place of articuation as a reference point for cardinal 1, [i]. A mirror is a useful tool when practising degrees of jaw opening and lip-rounding. However, it’s very important to remember that we cannot state precise tongue positions for each vowel, and this is why the cardinal system is so useful and important: we use our ear rather than our vocal organs to gauge the right qualities, with Jones’s own demonstrations as the “gold standard”. To train your ear, you can listen to audio clips and take a listening quiz here. The problem here is… that Daniel Jones himself doesn’t know how to pronounce these vowels. These are the cardinal vowels, not the vowels of whatever language you speak.